Welcome to the heart of Revival! Our main showroom is an open and welcoming space artfully arranged in room settings and sure to inspire your home design creativity. We strive to find and refurbish timeless furnishings your family will treasure. In addition to our vintage and antique furniture and accessories, Revival also features select new furniture, lamps, chandeliers, mirrors, art and decorative accessories. We also offer our own line of handcrafted farm tables, each one custom made to your specifications. We specialize in functional, usable, time-tested pieces—furniture that stands up to today’s lifestyle. 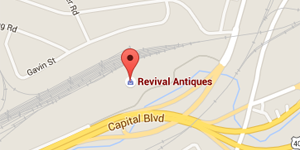 Revival is not a traditional antique store. Our well curated blend of old and new, primitive and modern, industrial and classic reflect today’s home design trends. We believe your home should showcase your unique personality and style, and or selection lets you do just that! Our constantly changing inventory is kept fresh and original, thanks to numerous regular trips throughout the northeast seeking out antiques, industrial and unique vintage finds from a select network of pickers, dealers and auctioneers. And our regular visits to High Point and international accessory markets ensure we keep up with design trends. Let our experienced staff help you bring this creative style to your home.